Gary Bailey, 63, in a field of soft white winter wheat, says, "If you're not growing, you're going backwards." Wheat has taken Gary Bailey around the world. Rumbling amid rows of soft white winter wheat on a recent afternoon, the third-generation farmer pulls his Dodge Ram pickup alongside the local co-op grain elevator in Ewan — a tiny crossroads an hour's drive south of Spokane where jagged basalt country meets the rolling Palouse. His work used to stop here. "Get my check and I go on my happy way," Bailey says. "Well, that's not the end of the grain." Nearly 90 percent of the state's wheat gets exported, primarily to Asia for use in sponge cake, noodles and other baked goods, according to the Washington Wheat Commission. The state's farmers harvested 2.2 million acres of wheat in 2016, supporting more than 8,100 jobs. 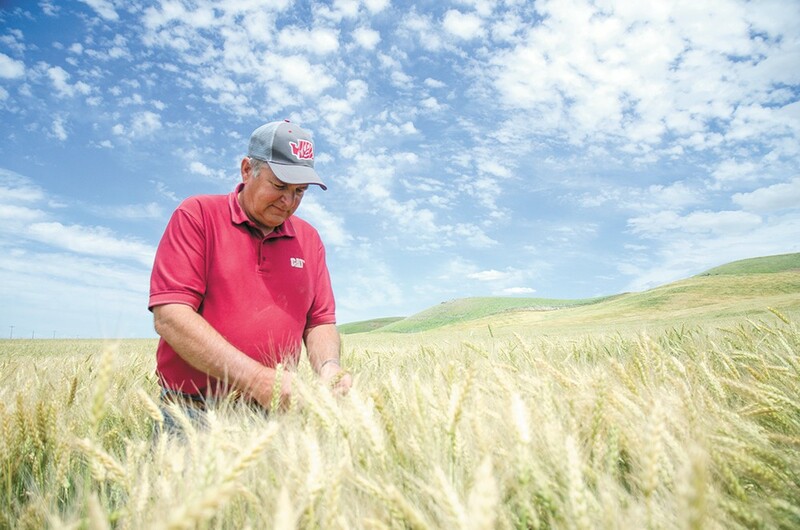 As chairman of the commission, Bailey, 63, now tracks the wheat industry across oceans. He follows his truckloads of wheat from the elevator to the regional rail hub where it catches a train for Wallula. Workers there load it on barges down the Columbia River to Portland for shipment to the Pacific Rim. "It's really opened my eyes," he says. In recent years, Bailey has made several diplomatic trips to Japan, Taiwan, the Philippines and other markets to reinforce trade partnerships. "We've put over 50 years of effort into opening those markets," he says. "We've got long-standing relationships with these customers. Who knows what's going to happen?" Palouse wheat farmers, apple pickers, Boeing machinists, Microsoft coders, longshoremen, truck drivers, whiskey makers and others all make their livings off global trade. Lori Otto Punke, president of the Washington Council on International Trade, says a recent study links 40 percent of all the state's jobs to trade — making it one of the most trade-dependent states in the country. As the Trump administration looks to levy new 25 percent tariffs against China this week on top of heavy steel and aluminum taxes on several allies, Punke says the accelerating trade conflict could disrupt supply chains across many of the state's key industries. Prices for raw materials or production components will likely rise while retaliatory tariffs undercut U.S. sales abroad. Production could stall. Workers could face layoffs. Fruit could rot in the fields. "Supply chains are so integrated at this point, you're basically slapping a tariff on U.S. goods here," she argues. "It's a very tight circle. ... And a trade war isn't a rifle, it's a shotgun." With its proximity to Asian markets, abundant resources and deepwater ports, Washington has always served as a natural gateway to the world. Giants of industry ranging from Weyerhaeuser to Amazon have helped cement a culture of globalization into the state's economy. 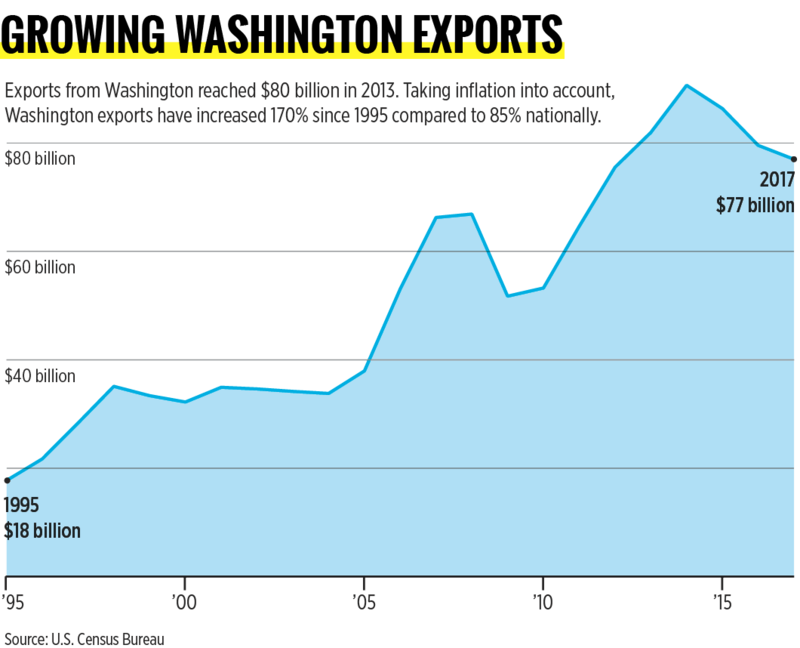 The U.S. Department of Commerce estimates Washington exported about $77 billion in goods in 2017, while shipping out tens of billions of dollars in goods passing through from other states. Robert Kapp, a Port Townsend-based international trade consultant and former president of the US-China Business Council, says Washington's trade legacy traces back to the nation's western expansion. "It's a true mythos," he says. "Washington developed as a gateway." Boeing, still the country's largest exporter, created a huge "ecosystem" for aerospace and other manufacturing, Kapp says. Farmers have always grown more than the state could consume. The ports and rail have anchored the transportation infrastructure to move everything. As trade relations formalized in the decades after America's notorious Smoot-Hawley Tariff collapsed world markets in the 1930s, developed nations sought to establish ground rules for global commerce through joint trade agreements. Washington took on a key role in the opening of trade on the Pacific Rim. Kapp says Seattle hosted the Asia-Pacific Economic Cooperation meeting in 1993 to great success, re-invigorating optimism around international trade. "We're very concerned about the approach on this. If you're a trade professional, this is pretty egregious." "We finally made it into the big time," he says. The North American Free Trade Agreement the following year broke down other long-standing barriers. But a swift backlash to globalization hit the World Trade Organization's meeting soon after during the 1999 "Battle of Seattle" protests. Kapp called the riots a "punch in the gut" for trade. In the years since, tech companies have transformed the state around a borderless economy. Punke says political representatives have long offered bipartisan support for expanding trade and Seattle has become a magnet for digital startups with international talent. "Washington state's economy has really evolved a lot," she says. "I don't think that our gift of geography explains everything." Brian Bonlender, director of the state's Department of Commerce, says Washington now has the highest export value per capita — about $6,000. The region also benefits from strong tourism as well as a number of universities that recruit international students. "We're seeing a lot of growth," he says. "We've been, as a people, proactive in engaging the rest of the world." Many large companies — household names in both the U.S. and abroad — have come to call the Evergreen state home. Boeing. Starbucks. Microsoft. REI. Amazon. Costco. Weyerhaeuser. Nordstrom. The list goes on. Bailey steers his Ram pickup down another stretch of gravel road, scanning the fields. When his family bought this place, they worked about 800 acres of wheat and barley. In the years since, more efficient farming equipment and practices have increased yields, reduced labor and allowed them to take on more land. Bailey says they now harvest about 3,000 acres a year. Other farmers, working on a tight profit margin, have also expanded their operations. Local grain elevators and rail stations have increased capacity to meet the new traffic going to market. "If you're not growing," Bailey says, "you're going backwards." But the rush for a competitive edge on the world market has created winners and losers throughout the state. As trade barriers drop for farmers to sell abroad, it also becomes easier to import finished products or move manufacturing overseas. Lynne Dodson, with the Washington State Labor Council, says many union workers staff the supply chain for the state's trade economy. They drive trucks, load ships and stock shelves. But other workers in once thriving steel and lumber mills have seen their jobs outsourced to cheaper labor in other countries. "We've had too many policies that are pursuing the lowest wage rate," she says. "We have to stop this race to the bottom." Dan Wilson, president of the United Steelworkers Local No. 338 in Spokane, put out a statement in March supporting the Trump administration tariffs on steel and aluminum imports. The union, which represents Kaiser Aluminum and other local workers, argues imported steel and aluminum have devastated domestic companies and cost thousands of American jobs in recent years. "We shouldn't ... be expected to compete against other nations and the cheating and subsidizing they have done to steal our markets," Wilson writes. "When we have that level field, North American workers can compete with any workers in the world." While the labor council has serious concerns about Trump's heavy-handed trade proposals, Dodson says changes to trade policy are long overdue. She argues U.S. workers deserve fair protections to compete for domestic and emerging markets, such as green energy. "Really what we want is a balance," she says. "Tariffs can be a part of that. ... [But] I can totally understand why the agriculture sector is concerned." Most U.S. trade experts agree China has manipulated existing trade policies in ways that harm American interests. That dynamic legitimately deserves attention, they say. The country has flooded markets and stolen intellectual property. As the world's largest economy, China also exported $375 billion more in goods to the U.S. than was sent back last year, continuing a trade imbalance where for every $100 the U.S. spends on Chinese goods, it gets back just $26. Trump has responded by imposing tariffs on $34 billion in Chinese products starting Friday, with another $416 billion in potential import taxes. Those proposed tariffs follow sweeping new import taxes of 25 percent on steel and 10 percent on aluminum from the European Union, Canada and Mexico — a move that has resulted in a flurry of retaliatory tariffs from close allies. "We're very concerned about the approach on this," the trade council's Punke says of the wide-ranging tariffs pursued by Trump. "If you're a trade professional, this is pretty egregious." China remains Washington's largest trade partner, importing more than $18 billion last year, more than from any other state in the country, according to the U.S. Department of Commerce. China sent back another $14.6 billion in goods. "When we have trade wars, it impacts the Washington economy in a major way," U.S. Sen. Maria Cantwell notes in a recent Finance Committee hearing. "We're very, very concerned." 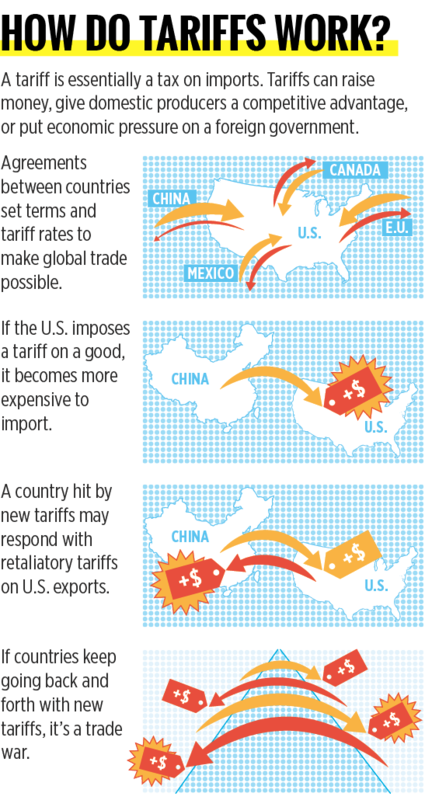 Experts say the problem with broad tariffs is the difficulty in predicting the impacts on U.S. companies. In response to the steel tariffs, Canada and the EU have raised taxes on whiskey amid other items. Don Poffenroth, of Spokane's Dry Fly Distillery, says he's already lost orders. Breaking into a new foreign market typically takes about a year of work, Poffenroth says. But a Canadian buyer has cancelled a 2,000-case order and the EU distributor has stopped ordering. He estimates those markets make up about 10 percent of his sales. "It is definitely affecting multiple phases of our business right now," he says, noting the steel tariffs also make it more expensive to buy tanks for a planned expansion. "The best-case scenario is [the tariffs] go away, before the customers do." A breakdown in trade with China also presents an immediate threat to Washington cherry growers who have already started the year's harvest, says Mark Powers, president of the Northwest Horticultural Council. Those farmers cannot slow production or wait out a trade war. They have to sell off their perishable crop when it's ripe. "There is no other place to move those cherries," he says. "We don't have another China." The council reports China bought about $127 million in cherries from the Northwest last year, more than any other country, but have recently listed cherries on retaliatory U.S. tariffs. Powers says the negotiation outcomes look "bleak" for the cherry industry right now. "If it reaches a point that they can't even pay for labor," he says, "then it will rot on the trees." Wading out into the waist-high wheat field, Bailey pinches the spike of a nearby plant, digging a thumb between the kernels. He picks through a few more. The crop has looked good this year and he wants to help feed the world. He would like to see an open market where he can send his grains off to millers in Japan or Thailand or, increasingly, China. Bailey says he still remembers the 1980 grain embargo with the Soviet Union that hit U.S. farmers hard. He worries retaliatory tariffs could price U.S. wheat out of hard-fought markets. And once they get replaced in a buyer's supply chain, they might not win them back. "I understand when you talk about China and the technology problems that we have," he says. "I understand why you would want to bring them in line, but isn't there a more effective way to do that than creating tariff wars?" Dodson, with labor, says trade does not have to be a "zero-sum" game, but the Trump administration will need a clear strategy. Punke says the president's posturing threatens decades of trade growth and economic prosperity, especially in Washington. "People feel this is getting real," she says, "and it's getting real fast." Bailey looks out across the acres of rippling wheat, just starting to turn from deep green to a ripen gold. Farming is always a gamble, an attempt to control chaos, mitigate the unpredictable — like frost or drought or bugs or disease. Is Washington the most trade-dependent state in the country? The original print version of this article was headlined "Made Local, Sold Global"